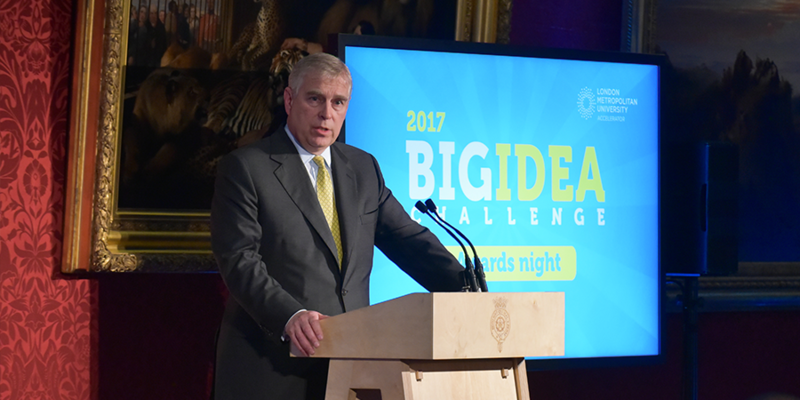 Thank you everyone who attended our Big Idea Challenge awards night at St James’s Palace hosted by His Royal Highness The Duke of York! It was an inspirational, fun and amazing evening that saw Fresh Start crowned the overall Grand Champion. The famous Queen Anna’s Palace room was filled with 250 guests – students, staff, finalists and partners – all there in celebration of the best Big Ideas to come from London Met and the incredible 17 college partners who took part this year. Our guest speaker for the evening was UK Ambassador for Creative Small Businesses and Founder of the online marketplace notonthehighstreet.com, Holly Tucker MBE, who inspired the audience with tips for turning their ideas into real businesses. And then it was time for the main event. The Duke of York presented the 11 awards of the night to our excited winners and made a passionate speech about the power of entrepreneurship. He even generously offered to support the finalists by opening his network to them! We are so proud of all the winners and our finalists from the evening. You can read the full report here. A big thank you to our partners – NatWest, Microsoft, Princes Trust, Disrupts, Lucidica and Amplify – for helping make this our biggest and best competition so far! Now, we would like to announce the winners from the evening! Click on the links below to see the videos about their Big Ideas.